Teyja Balgas from Halau Hula Ka Hale'o I'o performed at last year's Prince Lot Hula Festival held in Moanalua Gardens. Two longtime hula festivals continue their traditions this weekend -- the 32nd Annual Queen Lili'uokalani Keiki Hula Competition and the Prince Lot Hula Festival, celebrating its 30th anniversary. 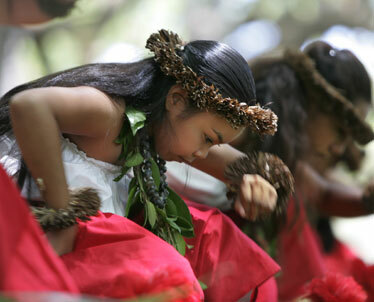 In the Lili'uokalani competition, more than 400 children, ages 5 to 12, from Oahu, Maui, the Big Island and Japan, will perform with their halau in hula kahiko (ancient) and hula 'auana (contemporary) styles. Solo dancers will compete for the Miss and Master Keiki Hula titles. Returning to the competition after more than a decade's absence is Halau Hula 'O Kahikilaulani from Hilo, and kumu hula Rae Fonseca. New to the contest are Halau Kala'akeakauikawekiu from Kailua-Kona (kumu Kenneth Aloha Victor) and, from Wailuku, Halau Kekuaokala'au'ala'iliahi (kumu Brandon and Haunani Paredes, Brandon being a Master Keiki Hula winner from 1987). Winners of the Japanese competition will also be featured, with solo girl and boy competitors from Hula Kalei o Pualani (Hitachi) and Hula Studio Lei (Nagoya), and a group of boys from Kamakura in Halau Hula O Na Kamali'i O Ka La. THE PRINCE Lot festival has grown into Hawaii's largest noncompetitive festival, named in memory of Prince Lot Kapuaiwa, who reigned as Kamehameha V. The prince is credited with reviving hula in the district of Moanalua, and his summer cottage can be found on the Moanalua Gardens' grounds. Besides hula, the event will include demonstrations of Hawaiian arts and crafts, and the Queen Emma Hawaiian Civic Club will teach ancient games. Although admission is free, proceeds from food and merchandise sales that day will benefit programs of the Moanalua Gardens Foundation. And a $5 button donation will be requested to help defray costs. This year's festival honors the memory of kumu hula George Holokai of Halau Hula O Namakahulali, who participated in the very first festival. A tribute, "E Hula Mai Oe," will be performed by master students of Holokai's.